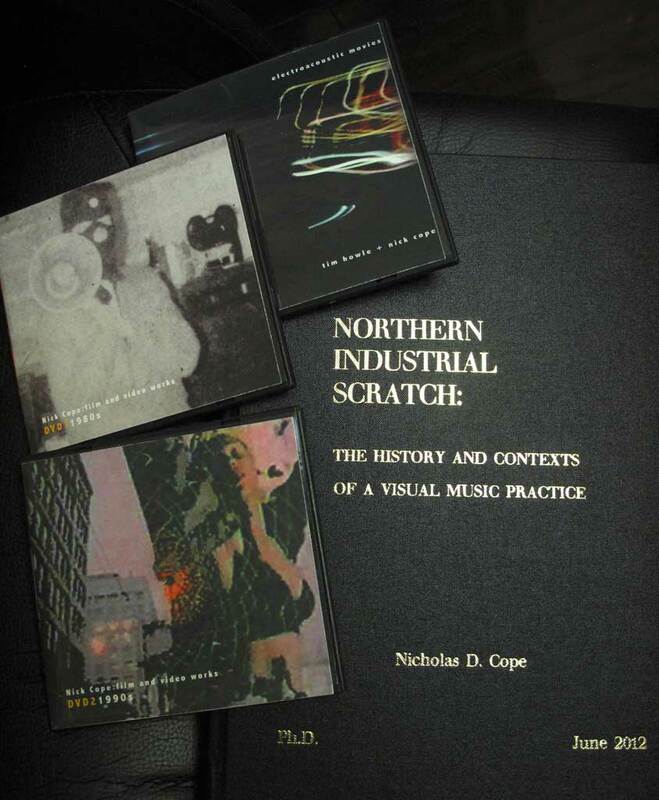 PhD by Existing Creative Published Work; Northern Industrial Scratch: the history and contexts of a visual music practice, University of Sunderland, October 2012. Locates a contemporary visual music practice within current and emerging critical and theoretical contexts and tracks back the history of this practice to initial screenings of work as part of the 1980’s British Scratch video art movement. At the heart of this work is an exploration and examination of methods and working practices in the encounter of music, sound and moving image. Central to this is an examination of the affective levels that sound and image can operate on, in a transsensorial fusion, and political and cultural applications of such encounters, whilst examining the epistemological regimes such work operates in. The critical commentary presents and contextualizes a film and video making practice spanning three decades. It locates a contemporary visual music practice within current and emerging critical and theoretical contexts and tracks back the history of this practice to the artist’s initial screenings of work as part of the 1980’s British Scratch video art movement. At the heart of the body of work presented here is an exploration and examination of methods and working practices in the encounter of music, sound and moving image. Central to this is an examination of the affective levels that sound and image can operate on, in a transsensorial fusion, and political and cultural applications of such encounters, whilst examining the epistemological regimes such work operates in. A combination of factors has meant that work such as this, arising in the UK provinces, can fall below the historicizing and critical radar – these include the ephemeral and transitory nature of live performance work; the difficulties of documenting such work; the fragility and degeneration of emerging and quickly obsolescent formats; and a predominance of a London–centric focus on curating, screening and historicizing of experimental film and video art practices. My film and video practice has been screened nationally and internationally over three decades, and has been recognized as exemplary practice both in the early 1980s at the inception of the Scratch movement and in more recent retrospectives. The critical commentary argues that this work contributes new knowledge of the history, contexts and practices of film and video art and audiovisual and visual music practices. Three DVDs were submitted with the commentary evidencing work produced over three decades and constituting the body of work under consideration. All the material is available to view online. extras: Further evidencing film loop, video mixing and Super 8 film practices (24min). Includes original footage broadcast on Croatian TV, September, 1990. Includes original footage broadcast on VPRO Television, Amsterdam, February 1993. 16. Mandragora: Click on This, 6’56” (1999) – visually remixing work originally produced for the Cabaret Voltaire project. extras: Additional work produced for Mandragora’s music. Club Zombie evidences early experiments with digital video animation techniques and non-linear editing (16min). Good imagery, keep the good work up!! !